I’ve never posted Olive Garden’s Zuppa Toscana Copycat because for decades Olive Garden’s Zuppa Toscana (and their Pasta Fagioli Soup) was right on Olive Garden’s Recipe Page. When I decided to make Zuppa Toscana the other day, I noticed the OG has removed both soup recipes. Since I can’t be dragging out my recipe box all the time, posted below is the original Olive Garden’s official recipe for their Zuppa Toscana. And yes, it tastes exactly like the Zuppa Toscana at the restaurant. When I was at the folk’s and my sister, Liz, visited, Dad announced he knew the perfect little Mom and Pop Italian place for dinner. The name escaped him but we were assured it was excellent and he knew just how to get there. Into the car, we piled, and into the city, we drove. And drove and drove and drove. And Dad turned in to a strange little area, the back way…bless his heart, Dad always had a top-secret back way to get to anywhere! As a matter of fact, on any trip with Dad, I never knew if we were on a secret back way or just actually lost, or both. But there it was, beckoning above the buildings. The sign. My baby Sis gave me a big nudge as she spotted it. The folks loved Olive Garden and I learned to love it too. I didn’t mind at all that we’d come home with enough leftovers so I wouldn’t have to cook the next day or two, either. We celebrated Pat’s 91st birthday there. We got wine and I got carded. I took out my ID and said “Really? You’re going to be so embarrassed.” I’m a Grandma. Five times over plus two! When we came up to the Twin Cities looking at an assisted living center, of all the places we could eat, we ate at Olive Garden. It was the perfect comforting touch for the folks who were seriously out of their element. And Olive Garden’s Zuppa Toscana Copycat is the perfect comforting soup. Potatoes, Italian sausage and kale, flavor for days, all in a light broth with a just a touch of cream. And it always comes to the table, just like shown in my photos, with the slightest bit of orangy red tinge from the oils in the sausage. I think most bloggers make a point to remove every last drop of it for their photos, but that’s how it’s served at Olive Garden, and that’s where so much of the flavor is. I love this soup; I even crave it. Now if only I had breadsticks! Olive Garden’s Zuppa Toscana Copycat is super easy and fast to make, and the only thing I altered (if memory serves – I think my recipe card was copied exactly) was to be a bit more specific and streamlined in the recipe directions. My recipe is all made in on pot, too, so I eliminated the tablespoon of oil in the original recipe that was used to saute the onions in a separate pan. There’s no need for it. The original recipe didn’t call for removing any of the oil from the bacon or the sausage like I do, but it’s too much and it’s obvious Olive Garden does remove most of it. Don’t be crazy about that removal, get most of it that you can, but there should and will be a little that floats to the top when the soup is served. The bacon should be chopped finely. I just cut across the package from top to bottom in thin slices, and four slices are 1/4 of the package. The bacon will all but disappear in the soup; it won’t be crunchy little bits but will bring a lot of flavor to the table! And the kale, when the soup is finished will be bright and still have a good bit of texture, just like OG’s. As for the potatoes, when the recipe is cooked right they will mostly be intact, but a few will be slightly crumbled and a few others will have lost their skin. Don’t cook them so long that they disintegrate, which is easy to do with such thin slices. I don’t sweat the exact amount of chicken broth if my package or amount isn’t exactly what’s needed. If I’m short, I make up the difference with a little extra water. If I have a little extra from a carton and I’m not going to use it right away, I label and freeze it. I don’t know how much gets wasted every year from partial cartons sitting in someone’s fridge to be eventually tossed, but it must be a lot. Has anyone noticed potatoes are getting pricier at the store? I’ve noticed that so many are now “name brand” and in smaller bags. And they do look prettier, all washed and uniform in size but you pay extra for that. Look to see if you can’t find larger, 10-pound bags of potatoes and pick them up. You can give them a sort yourself and use the larger, more uniform ones for bakers and the odd-sized shaped ones for recipes like this where size doesn’t matter. Potatoes that aren’t well-washed store better anyway, and you’ll want to store them in a cool, dark place, a paper bag works well, away from onions. So watch for sales, especially during pre-Holiday and Holiday weeks, like Thanksgiving and Christmas for great prices on Chicken Stock and Cream. Check Aldi and Costco, too. Their everyday prices are sometimes better than the grocery store sales prices. I buy quite a bit of stock during the holiday sales; even though I like to make my own (and it’s so good and cheap to make) I can’t really keep up with the quantities I need. If your store is sold out, get a raincheck. Cream, by the way, keeps for weeks past it’s “buy by” date. Kale can be tricky to buy. It’s seasonal, late spring and late fall because it’s a cool weather plant but that doesn’t seem to matter anymore with availability or price. And it’s only recently been available at the store up here in the frozen Nord and I have never seen kale at either Aldi or Costco. Some people sub in spinach (which I think gets slimy) or one of the Italian greens like chard. Whatever you buy, make sure to have a use in mind for the portion you don’t use. I have a few favorite recipes here using kale, just follow the link for kale at the bottom of the page and my Big, Fat Green Smoothies on a Budget are always an option for the tough stems and not so pretty leaves. Italian sausage does go on sale regularly so watch the sales and chuck it in your freezer, and you’ll probably want to rewrap it so it’s protected. 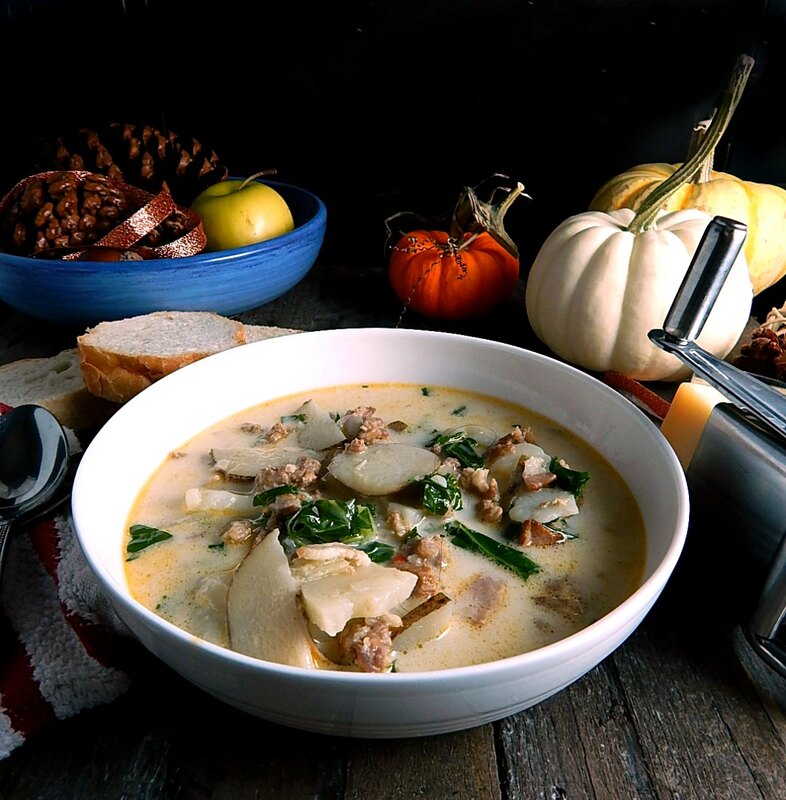 If there is any variation in the taste of the soup from the original Olive Garden’s Zuppa Toscana, blame your Italian sausage. I usually just use whatever we have at the store, nothing fancy, nothing from an Italian deli, but you sure could if you want. I also put the 1 pound amount that OG uses in the recipe, but I actually prefer the soup with a little less sausage, about 1/2 to 3/4’s pound is more than enough for me. Add bacon to a large pot or dutch oven. Turn heat on to medium-high and cook, stirring now and then until fat is rendered but bacon is not quite crispy; remove bacon to a paper towel-lined plate to drain. Add Italian sausage and red chili flakes to the skillet and break the sausage up into small pieces (a potato masher works well for this) cooking until no red remains on the outside, two to three minutes or so. Add in the onion, stirring often and cook until onion is translucent and sausage is lightly browned. Turn off heat and drain well; this is best done by putting the sausage/onion mixture on one side of the pan and tilting the pan for several minutes so the rendered fat accumulates on the far side, then spooning the fat off. Tilt by setting the pan slightly off the burner; if your burner isn’t raised, put a large spoon or some other heat-proof item underneath one side to raise the side of the pan with the sausage. Return pan to medium heat. Add garlic and cook until fragrant, about a minute. Stir in chicken broth and water and bring to a simmer. Add the potatoes and cook until just barely tender, about 10 minutes; no need to stir which will break up the potatoes; just give them a little nudge now and then to make sure they’re evenly distributed and all cook at the same time. When the potatoes are just tender, add kale and reserved bacon, cover and let cook an additional three to four minutes. Gently stir in heavy cream until heated through, about 1 minute; season to taste with salt and pepper. Note: 1 1/2 pounds of potatoes is 24 ounces, which is five medium potatoes, about 5 ounces each. A medium potato is about 2 1/4 inches across. I’ll be sharing Olive Garden’s Zuppa Toscana Copycat at Fiesta Friday #251 where this week I’m one of the co-hosts along with Monika @ Everyday Healthy Recipes. This entry was posted in Click here for Bargain Meals, Click here for Fabulous Food Posts and tagged Bacon, Bargain Meal of the Week, Italian, Italian sausage, Kale, olive garden, Potatoes, Sausage, Soup. Bookmark the permalink. Ohmygosh, YES. I am such an Olive Garden fan, even if it’s not trendy or cool! Probably equal parts nostalgia and carb love 🙂 This soup looks fantastic, I’m such a fan of potato slices in soups lately! Wow, what a hearty delicious sounding soup! Happy FF! Nice – will try this one day. Thanks Belinda, I will! Or at least I’ll pretend to, lol! This is just a great use for that Italian sausage. Hope you love it as much as we do! This is one of my favourite soups and I’ve been making it for years. Delicious. Because I always freeze a large part of any soup recipe, I don’t use spinach because it breaks down so much after thawing. Kale, or chard if the kale is not available, is preferred because it’s so sturdy. I feel the same way!! Nice to know it freezes; I’ve never had it around long enough to try it! Didn’t they or don’t they have a bottomless bowl deal on that soup for lunch? Oh, those bread sticks would be easy to make for an accomplished cook such as you. Love soup, so I’ll pin this one. Oh gosh, I should just make some breadsticks, but then I’d want to eat them all, lol! And yes, I think it’s bottomless lunch and when you go for dinner you can have as many refills on the soup as you want. When I’d go with the folks, I’d just eat soup and bring back my dinner, lol! !